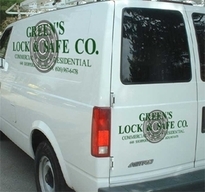 Green's Lock & Safe Co. was founded in 1973 by Michael Green, a warm and gentle craftsman. Mr. Green was a little ahead of his time in the locksmithing community. Mr. Green was developing computer software for master key systems in a time when most locksmiths were not using; or owned a computer. Mr. Green was a very well respected locksmith and customers truly enjoyed his craftsmanship. He was unfortunately stricken with an illness. At the time his apprentice Mr. Todd Faro purchased the shop before his passing, and remains to this day a family friend. Mr. Faro since then has helped the companies growth by investing in the employees and adding additional showrooms, technicians, and partners. Mr. Faro currently is a well respected and trusted teacher and adviser to the locksmith community and security industry. As a business owner Mr. Faro realized the importance of well trained employees and the commitment in helping them advance their knowledge in the industry; and security practices in general. Green's employees design ,install, and service some of the latest Access Control Systems, Surveillance Systems, Master Key Systems, Automotive Transponder & Remote Key Systems; Along with Custom Safe Applications. Green's has grown to become one of the most trusted locksmith companies throughout Southern California. Many customers choose Green's for its underling commitment and pride in providing the best solutions to many of today's security issues, needs, and concerns. Corporate Billing, Clean Trained Technicians, Fast response times, Multiple Showrooms, 24hr Mobile Service, Security Hardware Consulting & Training, and an overall satisfaction in providing the best products and services to the public. It is our honor and privilege to serve you security needs.